Summary: The Ab Rocket is a revolutionary way to work your lower, upper, middle abs and even your sides. The Ab Rocket is a revolutionary way to work your lower, upper, middle abs and even your sides, giving you the body that you’ve always wanted. In just 5 minutes a day, the Ab Rocket will rocket your abs from flab to fab! The Ab Rocket comfortably supports your head and neck while the rolling cushion action gives a gentle massage every time you work out. 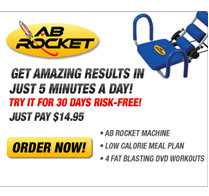 And with 3 levels of resistance, the Ab Rocket is perfect for exercise beginners and pros alike.